Gujarat has always been the favourite destination for various Muslim dynasties as it was once an important gateway for people to reach Hajj. For over a period of two hundred and fifty years from early 14th century, Indo-Islamic architecture has flourished in Gujarat. One can witness a charm and dignity of the Muslim rulers in the mosques constructed in the early 14th century. Starting from the time of the Gohris to the days of Mughals, most of the mosques were built to showcase the opulence of the rulers. Jama Masjid in Sanjan, an industrial town of Surat, is one of the oldest surviving mosques of Gujarat. 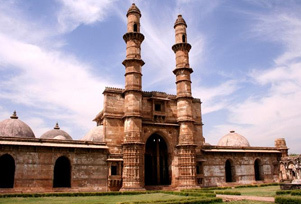 The best example of the most beautiful mosques in Gujarat is the Jama Masjid (Ahmedabad), Rani Sipri's Mosque (Ahmedabad), Sidi Saiyyed Mosque (Ahmedabad), Shaking Minarets (Ahmedabad). The mosque in Bhadresvar, Chhoti Masjid, Solahkhambi Masjid, and Tomb of Ibrahim, are some of the best examples of Gujarati Islamic Architecture. The Sidi Saiyyed Mosque is yet another out of the ordinary mosque in Gujarat. Unique points of the mosque are its unique architecture and stone structures, built under the reign of different rulers. The intricate jalis design of the mosque is the inspiration behind the logo of Indian Institute of Management, Ahmedabad, a premier institute in Gujarat. 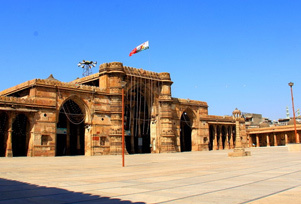 Jama Masjid in Ahmedabad is said to be the largest mosque in the region at the time when it was built. Jama Masjid in Ahmedabad, enhanced by its peaceful and gigantic courtyard, is ranked as India's most beautiful mosque. At the time when Jama Masjid was built, it was considered as the largest mosque in the Indian subcontinent constructed in its period. For five hundred years, many mosques were built in Gujarat that some of the finest stone architecture. Time, invasion and natural disasters have damaged these shrines in different degrees and many mosques have been rebuilt and repaired many times over. Fortunately, some of them are still surviving which depicts the impeccable poetry of stones and are seen in the mosques of Junagadh, Cambay, Bharuch, Surat, Champaner, and Ahmedabad. Gujarat is beyond its diverse landscape and vibrant, a visit to the mosques of Gujarat is a perfect place to begin a spiritual tour. Here's a list of popular mosques in Gujarat.